PT Pertamina Geothermal Energy - PGE or referred to as "Pertamina GE" is a well-established renewable energy company in Indonesia. Pertamina GE has strong business focus on eothermal energy utilization. Its business include exploration and production of steam and electricity generation. Geothermal energy is a thermal energy generated and stored in the Earth. Indonesia has potential pollution-free geothermal energy of 29,038 MWe or equivalent with 40% of world’s potential geothermal energy. PT Pertamina Geothermal Energy is a directly-owned subsidiary company of state-owned energy giant PT Pertamina (Persero) or Pertamina Group. At present, Pertamina GE is 90.06% owned by Pertamina Group and 9.94% by PT Pertamina Dana Ventura amounted to 9.94%. Headquartered in Jakarta, Pertamina GE now has 14 Working Areas, 4 Productive Geothermal Areas, and 7 Geothermal Development Projects spread in all over Indonesia (as of December 2015). 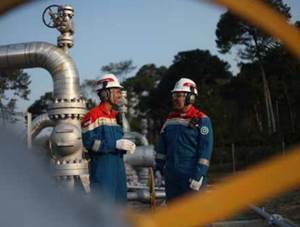 According to PT Pertamina Geothermal Energy Annual Report 2015 as cited by JobsCDC.com, Pertamina GE managed to record a total operating income of USD119.62 million in the fiscal year 2015. This total operating income equivalent with 111% of the target of USD107.55 million. Total comprehensive income in the fiscal year 2015 amounted to USD85.04 million, or 122% of the target of USD69.80 million. Total geothermal steam production equivalent to electricity as much as 3,056.82 GWh, or 7.96% growth as compared with 2,831.40 GWh in 2014. Minimum graduate with Bachelor of Engineering or equivalent. Minimum 15 years of experience in the field of inspection/quality control. Employment status: Contract Worker / PWT. Contract Period: Maximum 2 years of Contract Period. Minimum graduate with Bachelor of Engineering (Mechanical, Petroleum, Civil). Minimum 5 years of relevant work experience in the field of petroleum, gas and geothermal or Industrial machinery or construction / civil. Hands-on experience as Audit Team Leader with relevant work experience for at least 10 years. Possess expertise certification in Project Management & Business and Risk Management. Minimum 10 years of experience in the field of inspection/quality control. JobsCDC.com now available on android device. Download now on Google Play here. Please be aware of recruitment fraud. The entire stage of this selection process is free of charge. PT Pertamina Geothermal Energy - Junior Auditor, Auditor, Analyst, Senior Analyst Pertamina Group June 2017 will never ask for fees or upfront payments for any purposes during the recruitment process such as transportation and accommodation.